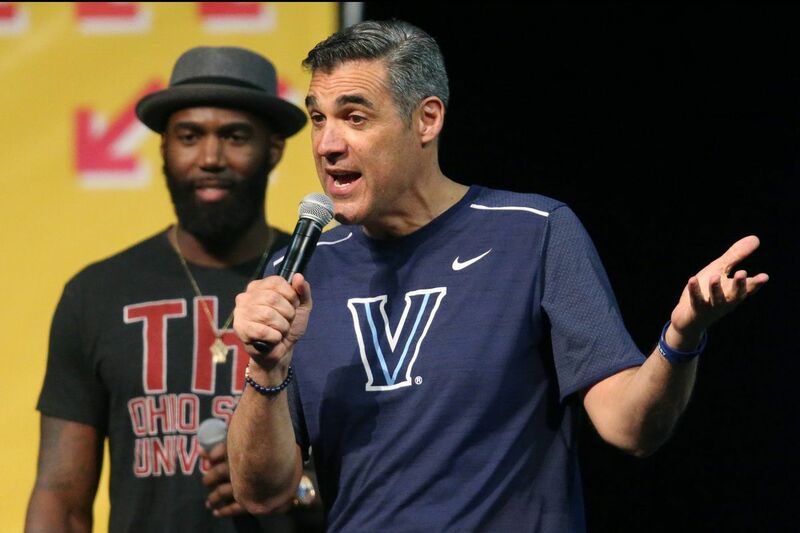 Villanova men's basketball coach Jay Wright speaks during the national college signing day. Justin Moore, a 6-foot-4 combo guard from DeMatha Catholic High School in Hyattsville, Md., announced Wednesday night he had made an oral commitment to Villanova for the freshman class of 2019. Moore, who is rated at four stars by 247Sports and Rivals, chose the Wildcats over Maryland, Louisville and Wake Forest. He also had received offers from Notre Dame, Virginia, Cincinnati, Xavier and Penn State. He announced his choice of colleges in a one-minute video on Twitter that showed highlights of his play and ended with the Villanova logo. Moore, who suffered a torn anterior cruciate ligament in his knee in January 2017, came back this season and averaged 16.6 points for DeMatha. He is playing this offseason with Team Takeover in Nike's Elite Youth Basketball League. He is ranked by 247Sports as the No. 58 player overall in the Class of 2019, the No. 1 player in Maryland and the nation's No. 8 combo guard. Moore is the second high school player to commit to Villanova's class of 2019, joining Eric Dixon of Abington High School. Among those congratulating Moore on Twitter was former DeMatha star and record-setting Villanova running back Brian Westbrook, who wrote, "Super happy for you. Villanova reloads."